Skinner kicks off the the three-day energy storage event. 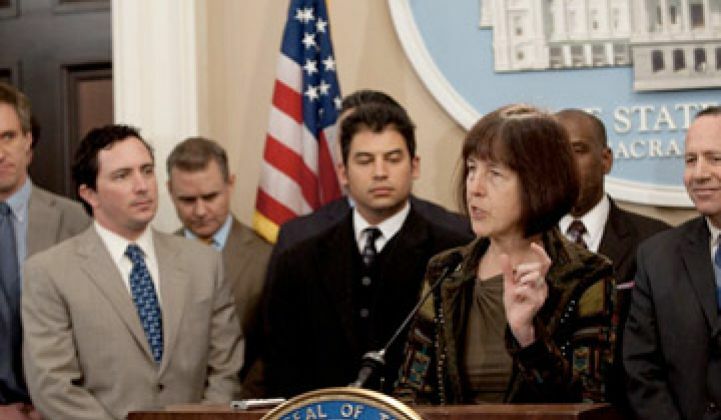 California Assembly Member Nancy Skinner (D-Berkeley) is the author of AB 2514, the first law to encourage the use of grid-scale energy storage. She kicked off the the three-day energy storage event presented by the Electricity Storage Association in San Jose, California. The event is a who's who of the energy storage world. This bill would require the California Public Utility Commission, by March 1, 2012, to open a proceeding to determine appropriate targets, if any, for each load-serving entity to procure viable and cost-effective energy storage systems and, by October 1, 2013, to adopt an energy storage system procurement target, if determined to be appropriate, to be achieved by each load-serving entity by December 31, 2015, and a 2nd target to be achieved by December 31, 2020. The bill, as originally drafted, actually included a defined and mandated target, but that was watered down to the above wording once the PUC and other stakeholders got through with it. Skinner acknowledges that there "was some pushback on 2514" but asserts that passing it now, in its current form, "sends the right market signal" to investors and utilities that "storage has to be part of our portfolio." While she is cited as the author, she credited the people in the ESA event audience as contributors, as well as the staff of then AG and current California governor Jerry Brown. Skinner is also involved in trying to pass an extension of the Self Generation Incentive Program (SGIP) that has to include an "explicit" inclusion of energy storage. We reported on Bloom Energy's mastery of that program here. As an undergraduate at UC Berkeley, Skinner studied under energy efficiency patron saint Art Rosenfeld. Skinner clearly understands the potential benefits of energy storage when she cites issues like national security, not having to build more peaker plants, and getting maximum value from renewables. Prior to the official start of the event, Ed Cazalet and David MacMillan of Megawatt Storage Farms spent four hours covering the regulatory and policy aspects of storage -- and where we need to go to get bulk storage on the grid at scale. More on that coming soon. Greentech Media has been at the forefront of covering energy storage and its potential for stabilizing a grid with a high-penetration of intermittent renewables. The conversation will continue to cover technology, policy, regulators and doubters. Stay tuned for more coverage of this year's Energy Storage Summit.